A series of recently unveiled artworks commissioned for Cardiff Airport hope to improve its battered image and help promote tourism, business and the Welsh economy. S Mark Gubb is discussing his contribution to a series of new art commissions at Cardiff Airport. Like so many small local airports, the advent of cheap air travel has changed it dramatically. Ten years ago it looked like a taxi rank. Now, it’s a middle of the road, struggling municipal airport with poor transport links to the nearest principalities. Its latest ignominy was being voted the worst airport in the UK in a recent passenger satisfaction poll. 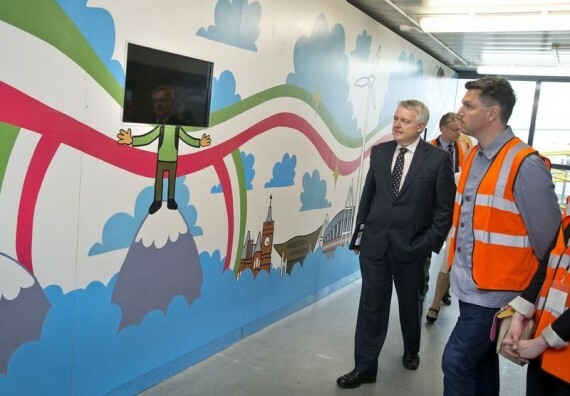 Even before its embarrassing accolade – and prior to it being bought by the Welsh government for £52million in March – First Minister of Wales Carwyn Jones was attempting to address these problems with the formation of the Cardiff Airport Taskforce. It’s aim? To offer travellers a warmer welcome, to look at ways of making the airport more popular, and to improve the all-round passenger experience – with the ultimate goal of attracting visitors and business to Wales. 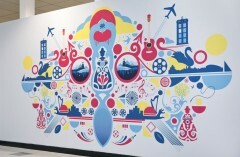 One of the components of the wider activity recommended by the taskforce was to include the work of artists from Wales as a way of welcoming inbound passengers. Cardiff-based agency Golley Slater were charged with delivering the project, with assistance from Chapter Arts Centre. The selected artists were Gubb, Pete Fowler, Craig Wood, and Matt Needle. 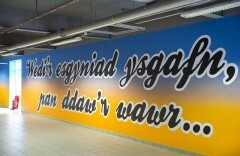 Featuring artworks in the upgraded walkways and public areas of Arrivals, the brief was to ‘celebrate and promote Wales’ vibrant culture, heritage, landscape, products and businesses.’ Gubb’s work does this by fusing a lyric from the Welsh band Super Furry Animals with a line from Wales’ most famous son, Dylan Thomas, to create the phrase: ‘Wedi’r esgyniad ysgafn, pan ddaw’r wawr… After the soft ascent, when dawn breaks’. The text alludes to the moment when a plane breaks through the clouds to reveal a perpetually glorious sunny day, reinvigorating our excitement about the journey as we arrive at our destination. Of the other commissions, Matt Needle’s Welcome Wall uses traditional Welsh cultural references with ultra-modern Welsh iconography, while Craig Wood’s wallpaper presents traditional iconography in a new way. 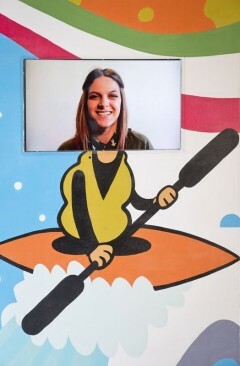 Pete Fowler fuses his trademark psychedelic style with large, high-definition TV screens featuring members of the Welsh public greeting people. The artworks were only unveiled earlier this summer and at this stage it’s hard to quantify what the real benefits might be in terms of economic growth. There are also questions to ask around how a project like this can not only promote cultural tourism, but also support it and the fragile arts infrastructure in the country. For now, though, it’s safe to say that arriving in Wales by air just got a lot more interesting.